After our walks in Antrim we move to Glencolmcille in Donegal where our first walk will be to Glen Head where we will visit a watchtower, one of the many built on prominent headlands at the turn of the 19th century to guard against a Napoleonic invasion. During this walk you will experience some of the most dramatic cliff scenery anywhere. We will also overlook Glencolmcille and the thatched cottages of the folk village. En route we will visit some of the ancient pilgrimage Stations of St.Colmcille, with their beautifully inscribed stones. 4 hour walk. 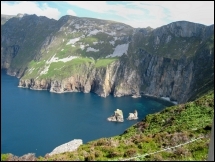 Our next walk will be along majestic Slieve League, the highest and one of the finest marine cliffs in Europe to Malinbeg. Right from the beginning you have a magnificent view of the cliffs extending 3 miles displaying their quartzites, schists, slates and conglomerates that compose the mountain – an amazing panorama of changing colours. Below, among the white-foaming waves, are the strangely shaped sea stacks known as the Giant’s Desk and Chair. On the walk you will pass holy wells and an oratory. The walk finishes on the beautiful beach at Malinbeg, Silver Strand, where you can cool your feet in the refreshing Atlantic! 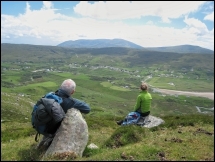 On our final walk we will wander through wild, romantic Glenlough where Welsh poet Dylan Thomas and American painter Rockwell Kent once stayed. We will walk towards the coast to the uninhabited townland of An Port from where fishermen still operate. 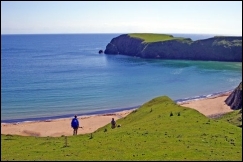 From there we return to Glen along the coast with its breathtaking scenery. A truly memorable walk which we can celebrate with a Guinness in Biddy’s!